A Previews Exclusive! Private Jennifer Redding was a member of the United States Colonial Marine Corps. She was part of a search and rescue mission sent to Acheron (LV-426) aboard the USS Sephora in 2179 to investigate the disappearance of the USS Sulaco and its crew 17 weeks earlier. 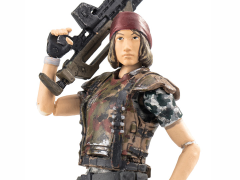 She is one of the playable co-operative characters in the video game Aliens: Colonial Marines, and now you can collect her as a 1/18 scale figure! Fully articulated, Redding comes with a variety of acessories and a base for easy display.